Ideal for stand-alone printers or manual load printer systems, a manual vision alignment system is an operator-assisted camera and monitor combination. For the customer that requires print-by-print substrate alignment to meet their registration requirements, an economical choice for a fully automated vision system is the HMI Manual Vision Alignment System. The operator teaches the system to recognize the printed image fiducials. 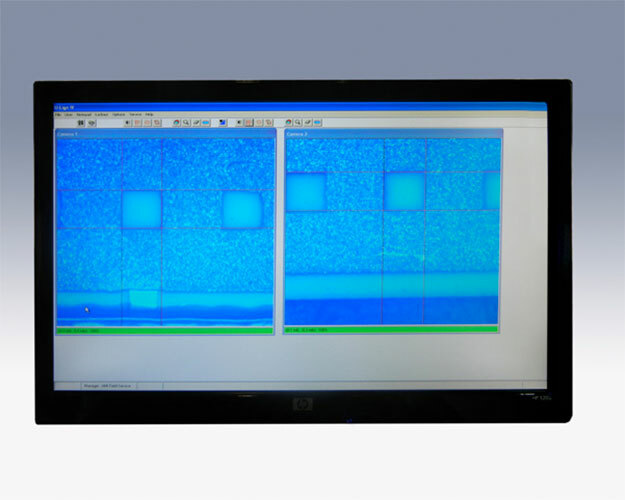 The monitors can then provide a target area, superimposed on the live substrate image. The operator simply adjusts the printer tooling stage until the substrate fiducials align with the targets. Similar to an automated vision system, the manual system is dependent on fiducial recognition. The fiducial can either be a specific image designed as a fiducial, or the HMI vision system can learn a fiducial from a printed image feature using edge recognition and pixel manipulation. Fiducial recognition also requires that the video component of the system be able to see the fiducial, regardless of its material composition or size. HMI offers several combinations of lens, lighting and video modules to ensure that the proper magnification, visual spectrum and pixel resolution are available to make the fiducial visible to the processing system and the printer operator. The HMI manual vision system uses a live printed image for training the system to the screen position. The printed image contains all the additive tolerance errors inherent in screen printing. Screen stretch, image shift, squeegee drag and many other dynamic properties associated with screen printing are all evident in the live printed image. The training print can be repeated at any time during the life of the screen to take into account the varying registration effects of changing screen conditions, such as tension loss. The ability to adapt to changing screen conditions can help extend the useful life of the screen and reduce overall process costs. The HMI Manual Vision Alignment System is a cost effective means integrating a precision adjusted registration system into your manufacturing process. The system is easy to use, adaptive to lighting and magnification needs and fiducial elements. In addition, the HMI manual vision alignment system’s image location set point is based on the actual printed image of the screen.